There are a few visual influences that really seared my brain and shaped it into the goo that it is today. The main ones are the Pirates of the Caribbean ride (When I was four), Blade Runner, Tank Girl (the comic, not the crap movie), and THE ROAD WARRIOR. That film has influenced me like no other. The “anything goes” mash-up style of that film’s look is something that never gets old and always inspires me. 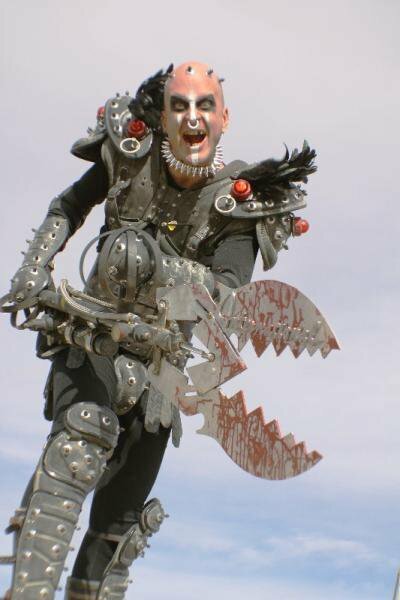 I started my first Road Warrior-inspired costume in high school. It sucked, but I learned a lot from doing it. Many, many years later I made a new one that looked basically like an amped-up Thunderdome guard that I named “Pez, brother of Wez” (ha-ha). Instead of going into the tedious details of how I made it, I’ll offer some basic tips and ideas for beginners. Don’t know how to sew? 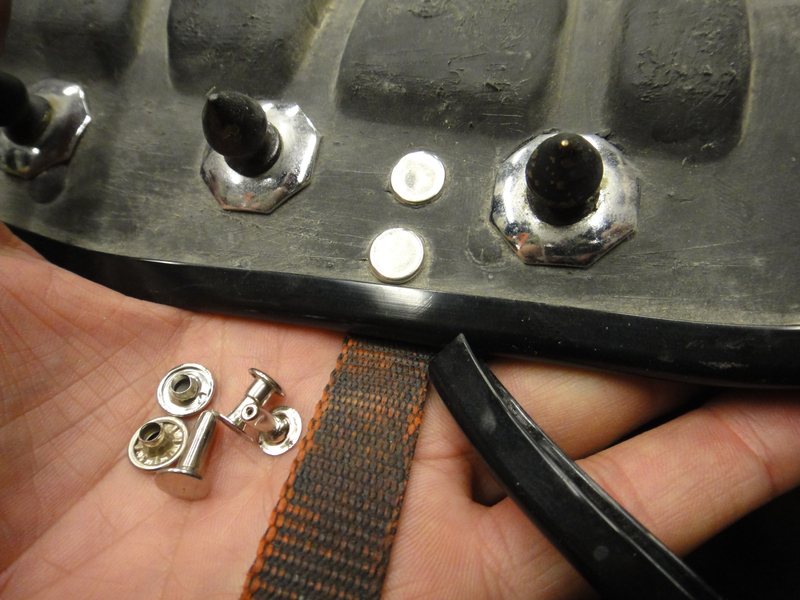 No problemo – glue it together! You can do a lot with clothing using a hot glue gun, contact cement, and Scotch brand 77 or 74 spray glue (available at better home improvement or craft stores). You can even use a desk stapler for hemming sleeves and legs, which can be hidden by gluing fur, or trim over ‘em. Leather rivets (available at Tandy, Sav-Mor, Saderma, and The Hide House) are an excellent way of attaching straps and modifying costumes. They pound together easily, and make smooth, low profile attachments. If you make a mistake, just crush the head with a pair of pliers until it pulls off. Sand plastic shoulder pad-type parts first and use good ol’ acrylic house paint for primer or the main color. It’s flexible, and won’t scratch or pop off as easily as enamels. If you want to use spray paint afterward, that’s fine. Since the edges are the first parts for paint to scratch off of, you can add vinyl, self-adhesive, door edge trim to plastic pieces before painting. Rolls of it are available in black and other colors at larger auto supply stores like Pep Boys. An easy weathering technique is thinning down a small cup of earthy/dusty-colored house paint with 50% water. Brush it all over your gear, and then wipe most of it off with a moist sponge, or paper towels. You’ll be left with dirt-looking paint in all the nooks and crannies. (Make sure you wet down all cloth material first so you can control the intensity of the paint by applying more water.) You can also dip a 1” disposable brush in the cup and “flick” the paint onto your stuff to give it a splattered/random look. “Rit” fabric dye (from drug stores) comes in loads of colors and is a great way of changing non-synthetic material. Acrylic house paint also works well on a lot of straps, protective gear padding, cloth hats, pouches, some leather, and clothing that doesn’t need to stretch or bend much. To keep theatrical oil-based makeup from being shiny and smearing, apply powder to it and lightly press it in with a powder puff. Brush the excess off with a clean blush/powder brush. Mustaches and fake beards are best held on with double-sided wig tape. Don’t bother with glues. Using little squares of tape spaced apart allows the fake pieces to move around a bit as you talk, or smile. Duct tape comes in many colors including good ol’ black. A search for “duct tape crafts” gives lots of helpful tips on how to make stuff with it – just like real wastelanders would! I highly suggest wearing your entire get-up and putting it through the paces for a few hours. Better for it to break at home where you can make it stronger. Your precious time in the wasteland shouldn’t be spent fixing your stuff, or nursing slam-dancing sores in spots where you wish you had put more padding. Nevertheless, I suggest bringing a repair kit with bailing wire, super glue, duct tape, two-part plumber’s epoxy putty, some black cord, and left over scraps of your building materials. 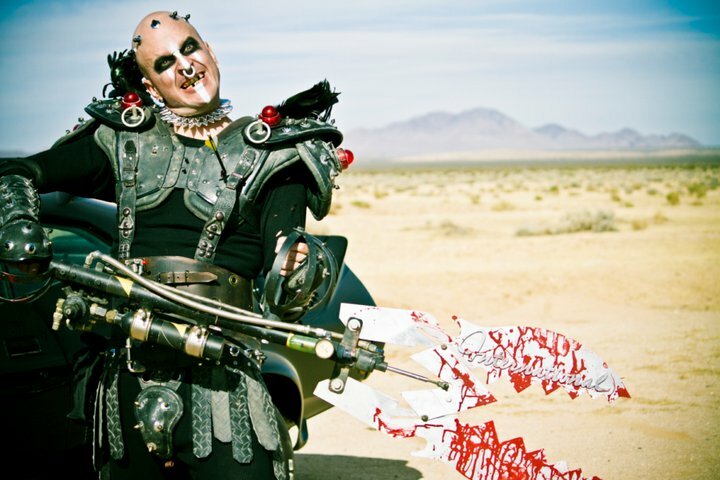 I was really impressed by the variety of costumes at last year’s Wasteland Weekend, especially by people who used different colors and materials that weren’t necessarily used in the Mad Max films. The great thing about post-apocalyptic costuming is that if your work isn’t perfect, it won’t matter. Flaws are bonuses. Make your mistakes look like intentional weathering, or natural wear and tear. The overall broad strokes are more important than noodley details. The Supply Sergeant surplus stores in Hollywood and in Burbank are good for cheap pouches, belts, camo netting, goggles, camping gear, etc. 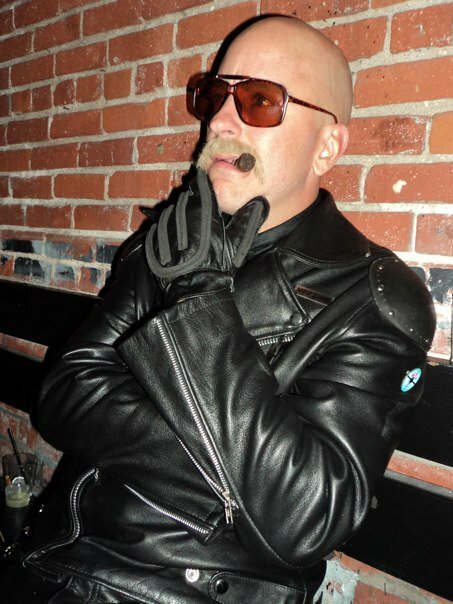 Jake McKinnon is a native of North Hollyweird and has worked on all kinds of entertainment industry projects, including low budget straight-to-DVD crap, and mega budget theatrically-released crap. He’s not available for hire to make costumes since his personal projects eat up all his time like a hungry, hungry vacuum.